The Decotherm insulated roller shutter is an especially strong and durable door. Incorporating the thoroughly optimised profile geometry with the strength of steel alloys and a special aluminium material, the technology involved in this roller shutter is exceptional. Extremely good roll-up action is guaranteed by the concave interior and exterior surfaces of the Decotherm lathe sections. A flawlessly designed set of hinges minimise heat loss and create a connection between the curtain and barrel without the usual pressure and wear marks from inferior roller doors. Colours are often underestimated when purchasing large products. In modern industrial and commercial architecture, coloured shutters are increasingly used as key design elements. Primarily due to their vast size, rolling shutters already play a key role in determining the visual appearance of the facade. This is why we offer you rolling shutters and rolling grilles in over 1000 colours based on the RAL and NCS colour charts. The Decotherm slat is available up to 10m wide and can produce a door height of up to 9m in the direct drive verison (DD) incorporating either a single or 3 phase drive motor system. 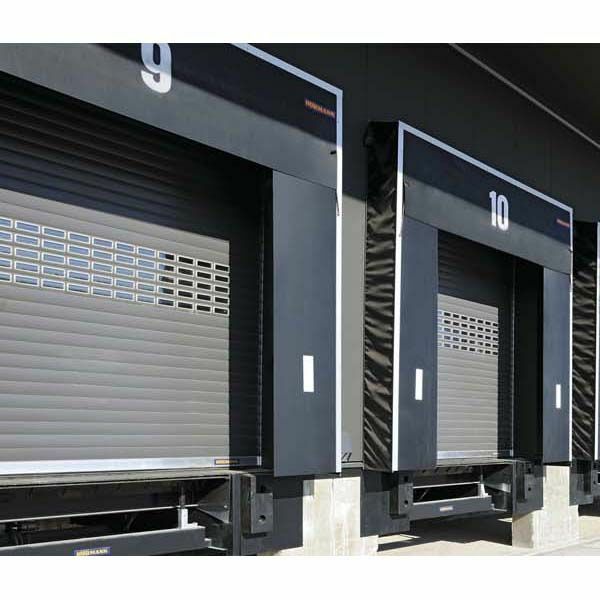 Samson Doors specialise in the supply and installation of uniquely made, high qulaity large roller shutters to various buildings such as aircraft hangars, car ports, factories, storage facilities and large manufacturing buildings. We offer fascia panels and fixed assemblies when gaps need filling in between the lintel and the opening width, wicket doors, external rolling shutters and angled bottom profiles to accommodate ramps and steps. Not as fast as a traditional high speed fabric curtai roller door but fast by any other comparison this door is available with an opening speed of 1.1m/sec using an optional motor drive system. Ideal for the doors where insulation is actually very important for the building. The spring balanced version of the Hormann roller shutter is availbale up to 5000mm wide x 4500mm high. Unlike the direct drive system this type of door is very easy to fit and can beaccomodated in much smaller installation areas with all components contained within the parameteres of the side guides and endplates. The WA 300 R S4 Operator with soft start and soft stop functions is to ensure quiet door travel, reducing wear on the door and operator. Variations are available depending on the door use and the installation area dimensions. The innovative tension spring assembly assists during manual opening and closing. Therefore rolling shutters and rolling grilles can be operated with little force. The SB rolling shutter and rolling grille can also be easily opened and closed via the interior and exterior handle. Operation is particularly easy with an optional chain hoist, which is recommended for doors higher than 3500mm. For modern hall architecture the Decotherm® rolling shutter offers a large variety of choices. You can integrate classic rectangular window into your Decotherm® rolling shutter. The Decotherm is available with a selection of window elements designed to offer transparency and allow daylight into the building. Each window segment consists of a double-skinned polycarbonate insert with high quality cover frames. There are a wide range of colours - more than 1000 RAL to choose from - you can also use colour to fortify your corporate design; colour is increasingly becoming a key medium for promoting a company's corporate image. The Decotherm is available in steel profiles. Special "full hard" steel makes these profiles resist damage caused by transport impact, fitting and operational wear & tear. Available with or without a colour coating - view our Colours section! All Decotherm profiles are coated with a protective paint which makes them resistant to adverse weather conditions. Polyamide particles embedded in the colour coating improve the sliding characteristics of the profiles and thus effectively reduce abrasion and noise.